Site traffic statistics is a useful tool for understanding a site's effectiveness and audience quality, which are two fundamental factors of a successful internet resource. Ad platform traffic statistics are gathered based on data from the site traffic analysis tool Yandex.Metrica, which is embedded into ad block code. Note that data aggregated by the Yandex.Metrica tag integrated in the ad code is read-only. This tag cannot be edited. Since YAN ad code is usually not inserted on all pages of a site, the data gathered by Metrica may not be complete. Therefore, we recommend that you and install the code snippet on all of your site pages. This will allow you to improve the site quality determination accuracy and receive additional visitation reports The Metrica tag only serves as a data collector and does not show any ads. Which content is most interesting to them? Which sections or pages are visited most frequently, and which ones are mostly ignored by users? Is site navigation convenient? Which navigation elements are used actively, and which ones are not used or are not visible to users? Is the content fully viewed, or does the user leave the page for various reasons? Do ad blocks fall into the user's field of view? Do ad blocks interfere with site content? Which ad locations provide the highest CTR, and why? To view a platform-specific report in the Yandex.Metrica interface, go to the list of platforms (Products → Content sites or Products → Search platforms) and click Metrica reports in the line with the required platform. A detailed description of these capabilities can be found in the section. Summary is the main page of your Metrica reports and enables you to quickly obtain information on traffic and other important indicators. 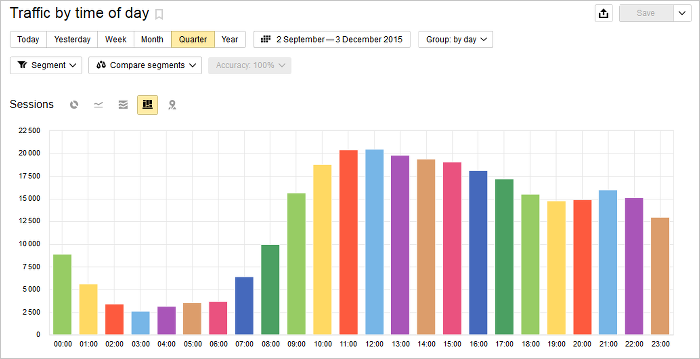 The report Standard reports → Traffic shows the level of traffic for any desired period of time. Using it you can determine the overall trend of user traffic on your site and, by understanding the relationship between “traffic and revenue”, forecast the level of income your site brings in. 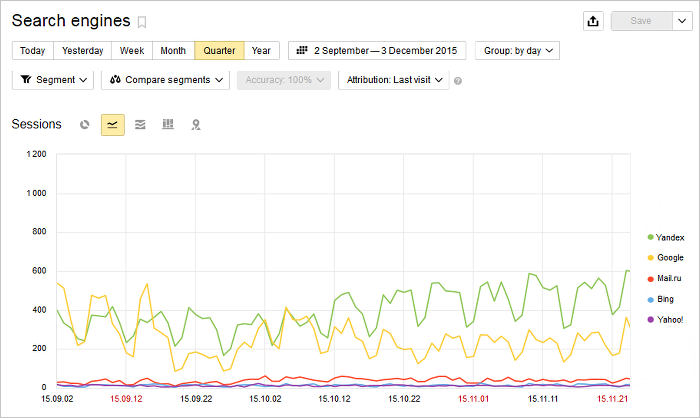 In order to assess traffic quality, you must first understand where the traffic came from. This can be seen in reports from the menu Standard reports → Sources, for example, Sites, Keywords or Social networks. Low-quality traffic degrades the indicators for your site and negatively affects revenue. Genuine search traffic is the optimal source of traffic for your site. By looking at Standard reports → Users, it allows you to estimate the socio-demographic composition and interests of your site's audience. 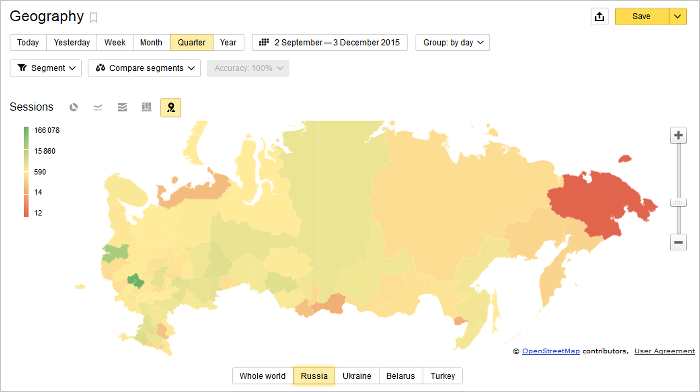 This can be important in evaluating how effective your ad blocks are on the Yandex Advertising Network. 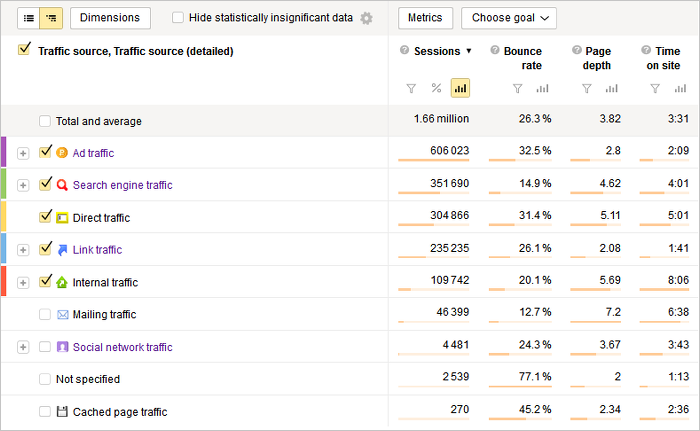 The Long-term interests report shows which subjects are more interesting to users of your site. Knowing the preferences of your users can help you decide how to develop your site. Use the Geography report to learn about the location of your audience. 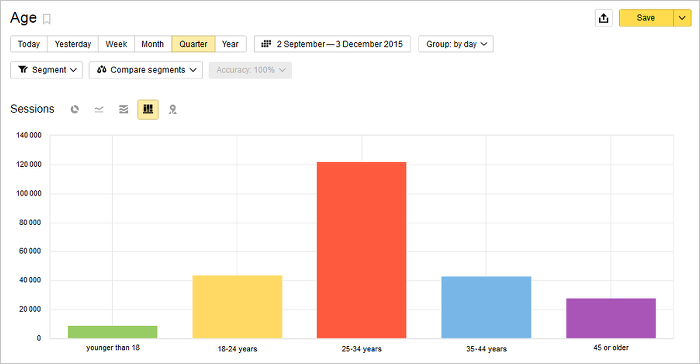 Use the reports in the Demographics section to assess the distribution of your audience by age and by gender. Use the reports in the Activity section to find out how much time users are spending on your site, the average page view depth, and how traffic varies depending on the time of day. 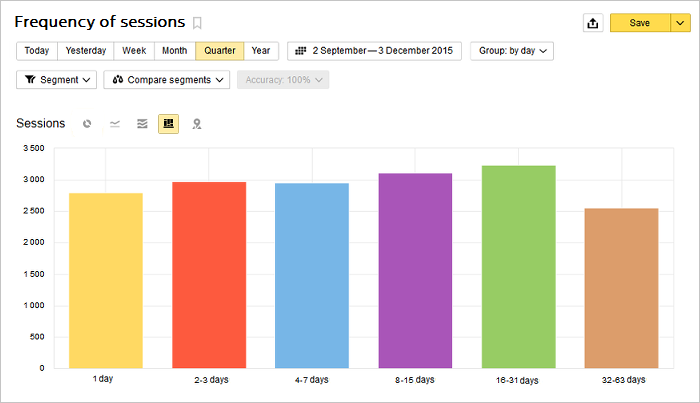 Use the Loyalty reports to evaluate the number of sessions per user, their frequency of sessions, the time interval between the last two sessions, and the time interval between the user's first and last session. The reports in the Standard Reports → Contents menu allow you to determine the most visited pages on your site as well as other details about user visits (for example, the currency or language used) and the used URL parameters. You can learn what the landing pages of your site are for your users, what pages they leave from after viewing your site, and what pages are shared on social networks. Analysis of this information can help you predict the behavior of your audience and prioritize while improving the quality of your pages. 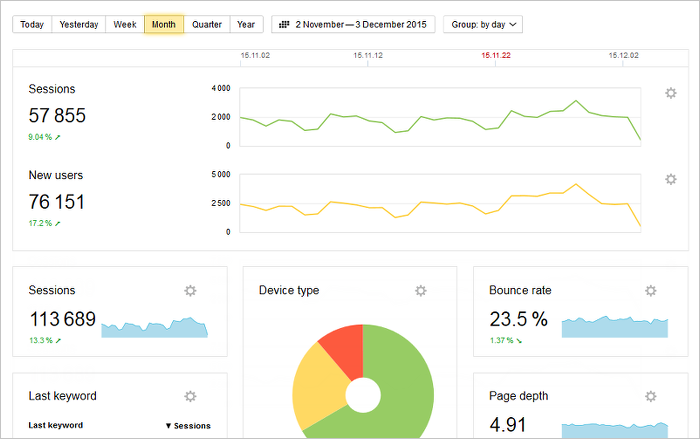 By looking at Standard reports → Monitoring, you can monitor the availability of your site, track its load in real time, see the average load time of pages, and view the number of robots that visit the site. 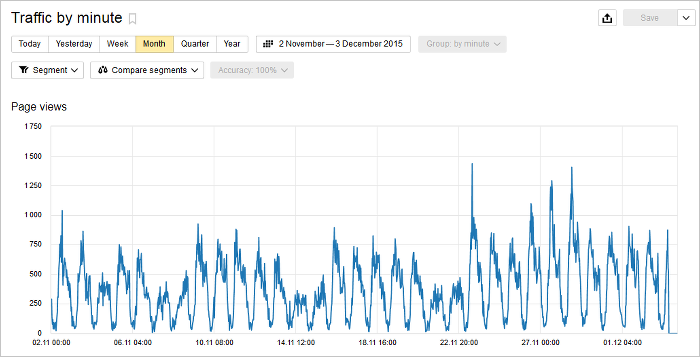 Analysis of monitoring reports helps keep track of potential problems with site access (for instance if a site cannot cope with a large number of users). 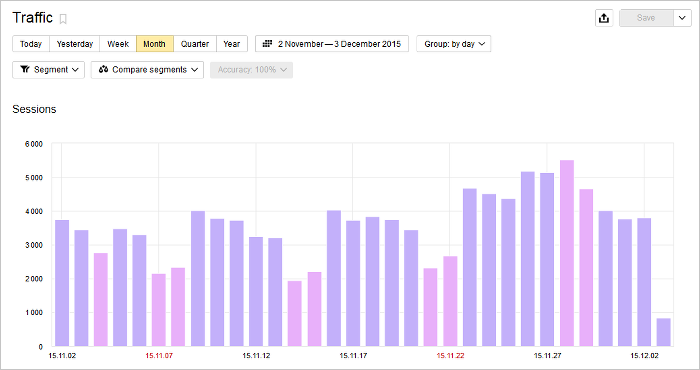 Use Standard reports → Monetization to estimate advertising revenue through a variety of indicators. For example, you can identify the most profitable traffic sources or check ad performance on different pages of your site. TheMonetization reports are enabled in the Yandex Advertising Network interface. Select a platform from the list (Products → Content sites or Products → Site search ad platforms) and click Edit. On the General tab, enable the option Show YAN reports in Yandex. Metrica and add the tag number in the Metrica tags field. 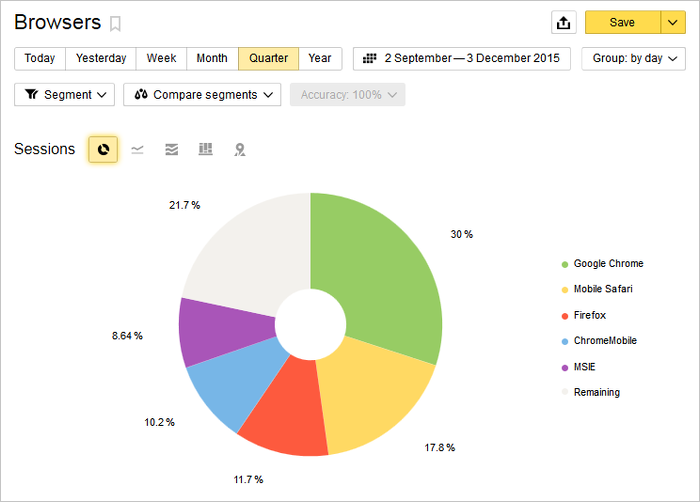 Reports will appear in Yandex.Metrica within 24 hours after you enable them in YAN. For more information about Monetization reports, see the . Any Yandex.Metrica report can be changed for a more complete and accurate measurement of the required figures for your site. Saved user reports will be available in the menu Reports → My reports. Link map is a tool used to measure statistics for link click-throughs on your site. The click map (often called a heat map, although it has more functionality than a traditional heat map) is a tool used to measure and display statistics on exactly where users are clicking on your site. In contrast to a link map, a click map displays clicks on all page elements and not just on links. Scrolling map shows how the attention of users is distributed on a page. This information will help you when placing Yandex Advertising Network blocks. 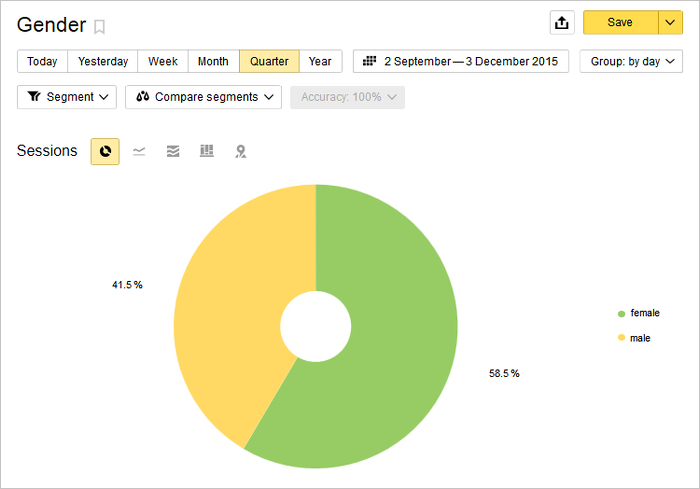 Form analysis allows you to understand how users of your site interact with forms. For each form you can find how many conversions, the average time it takes to fill in fields, and on which users left the form. Webvisor reproduces user actions in video format and lets you know what they do on the site: how they move around the page, how they move the mouse cursor and click through links.